The Swan Hill River Walk is a picturesque walking and cycling shared trail that follows the meandering Murray and Marraboor (Little Murray) Rivers. There are great expectations for this walk to deliver elements of interest to all age groups, in addition to fulfilling the needs of the local community and tourists. And in reality, the walk has achieved reasonable success in meeting these broad objectives. 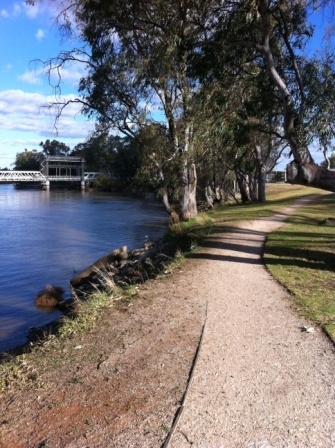 As an example, the section of the River Walk that follows the course from where the Marraboor River merges with the Murray River will be examined. This area commences at the Riverside Park, closest point to the centre of the town and concludes at the Milloo St Wetlands. This section of the River Walk is a leisurely 30-35 minutes return walk and the walking track is easily accessed by vehicle and bicycle with roads and car parks at both ends. It is also linked with footpaths entering residential areas in and around Milloo St and a short distance (two blocks) to the central business district at the Riverside Park end. Riverside Park is typical of any town park offering facilities for a family outing. There are undercover BBQs, picnic style seating, public toilets and extensive groomed lawns. The park also incorporates four playgrounds of which the two playgrounds for toddlers have safety fencing, one of which has shade sails to provide sun protection. Nearby, there is play equipment for young children consisting of larger slides and swings and a spinner. There is also a half basketball court for older children and teenagers and the lawn section is regularly seconded by children and teenagers playing team games. Prams and wheel chairs can access most facilities by either paved paths or the formed gravel paths offer a stable surface. The track that is the River Walk is positioned between the road and the river offering landscape views. Due to the proximity of the River Walk to the fast flowing water of the Murray River, children must be supervised. Leaving the Riverside Park in length, the River Walk heads towards the historic lift bridge that carries traffic over the border to New South Wales, however the walk avoids this busy road as it continues under the bridge. This can provide a sense of excitement as the bridge creaks and groans as traffic passes overhead. Following the Walk towards Milloo St, the landscape changes from the groomed lawns of the Riverside Park to open grassed space. 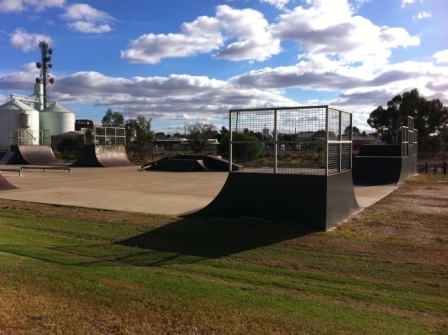 In this section a there is a skate park offering a haven for teenagers to claim territory that they do not need to share with adults, but has passive supervision from nearby residences. 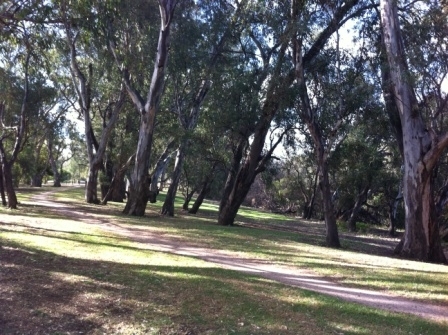 The Walk then arrives parallel with Milloo St in which it merges with road access to a boat ramp and the open space is filled with a forest of red river gums. This again offers an environment of mystery for children with places to run and hide and is also a popular fishing location for local children with the steep embankments between the Walk and river punctuated with more level locations that meet with waters edge. There are BBQs and seating facilities, but no public toilets at Milloo St.
BBQs, multiple playgrounds, expansive lawns, basketball half court. Boat ramp, BBQs, River Red Gums.